Marina is a keen musician; her musical ability was obvious from the time she could reach the keyboard. Coming from a large family, Marina spent much of her childhood surrounded by music and children and came to love both. 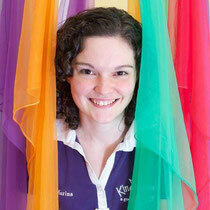 As a young adult, Marina came to realise her desire to make a difference in the community. Through her extended family Marina had seen first hand the wealth of developmental benefits introducing children to music can produce - and then she discovered Kindermusik. A qualified Kindermusik Educator since 2010, Marina joins her love of music and children together offering quality musical experiences while providing a foundation for future learning. Her goal is to inspire a curiosity and love of music and learning that will leave a lasting impression on each of her students.